Erfurt Christmas Market – For those who want to visit one of the most beautiful Christmas markets in Germany on their next city break, the Christmas market in Thuringias capital Erfurt is one of the most worthwhile options. From now on until December 22nd, the „Green Heart of Germany“ awaits you right on time for the Christmas season with its true firework of impressions, since Erfurt scores next to his historical sights with a perfectly organized Christmas market on a spectacular, medieval setting. Hold on the traditional cathedral square in Erfurt, you can find polyphonic Christmas acoustics, delicious mulled wine and a magical enchanted forest, all surmounted ny a 25 m tall, festively decorated Christmas tree and, nearly half as large, an original Christmas pyramid from the Erzgebirge. And the hustle and bustle doesn`t only happen at the Cathedral Square, since once you get there, it seems like that the Christmas market in Erfurt enlarges over the whole inner city – such as the 200 festively decorated wooden houses which encourages to stop by on a walk from the Cathedral to the Anger. Original Thuringian specialties like the Thuringian „Schittchen“ (delicious Christmas cake, the official season kick off was celebrated past Saturday) and the infamous Thuringian bratwurst will catch your addition: More recently, a special „Eco- Bakery“ invites adults and kids as well to make their own home baking cookies. If you want to read more about topics like Erfurt Christmas Market, we would like to welcome you to our Newsfeed! Octoberfest Erfurt: German Beer Festival at the Cathedral Square – The Oktoberfest in Munich may be the best known event called „Oktoberfest“ in Germany – but nevertheless, its counterpart in Thuringias capital Erfurt is a noteworthy event. 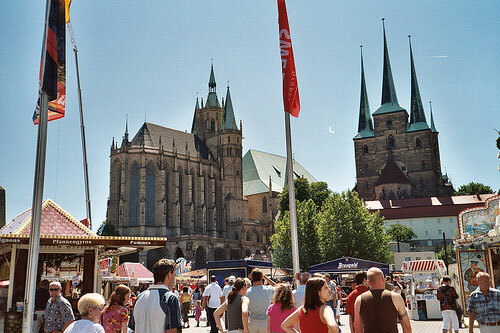 Scheduled for the period from 25 September to 10 October 2010, the Octoberfest Erfurt will take place at the imposing Cathedral Square, where performers, fast rides as well as the central point of the event, the huge marquee, are waiting for curious visitors. On every day of the Octoberfest from 6 pm, various artists perform live music, which can be considered as the perfect complement to the numerous rides and game booths. The start of Erfurt`s Octoberfest (Saturday, 25/09/2010) will be performed by a consortium consisting of the Lord Mayor of Erfurt, the festival host, the representative of the brewery as well as members of the festival committee. And according to the tradition of past events, they will arrive on the fairground around 6 pm, sitting in lovely designed horse-drawn carriages, to open the Oktoberfest 2010 by tapping the first beer barrel sponsored by the Thuringian brewery „Braugold“. If you want to read more about topics like Octoberfest Erfurt: German Beer Festival at the Cathedral Square, we would like to welcome you to our Newsfeed! Erfurt city trip: Merchant`s Bridge Festival – With the annual „Krämerbrückenfest“ (Merchant`s Bridge Festival), the city of Erfurt celebrates a medieval festival of superlatives since 1975, which scores besides the stunnung atmosphere with lots of arts and crafts of bygone eras. Known as the ideal opportunity to visit the capital of the „Green Heart of Germany“ Thuringia, interested visitors can expect picturesque streets, historic squares and imposing buildings in between Domplatz, Wenigemarkt and around the Merchants Bridge all located in the medieval Old Town. The festival, which will take place from 06/18/2010 to 06/20/2010, comes up further with culturally sophisticated contributions and al lot of medieval theater, artists, jugglers and musicians. As the highlight of the entire event, the famous medieval market offers traditional goods from original Thuringian craftsmen – all in a historic setting with specially designed tents, huts and inspiring costumes. If you want to read more about topics like Erfurt city trip: Merchant`s Bridge Festival, we would like to welcome you to our Newsfeed! „Specialties from historic times“ is the motto of Thuringias Heritage Days this year. Beeing renowned for its culinary and cultural delights, visitors can follow their senses in the former breweries and malt houses. Stroll through stately hunting lodges and their kitchens and dining rooms. Historic stone ovens will emit fresh bread smell, and traditional coffee shops and hotels will invite you to a stop. Starting on 13 September 2009, around 500 monuments will open their doors countrywide, including many that are inaccessible on regular days. In addition, many festivals and music will entertain all visitors with traditional german and thuringian customs. The Official season opener for this years Heritage Days will be on September 12th at Schloss Friedenstein in Gotha. The Oktoberfest has its origins in the wedding between the Bavarian Crown Prince Ludwig and the Princess Therese of Thuringia on October 12th in 1810. Since then, a big celebration took place every year in Munich – the festival you might associate with the term „Oktoberfest“. But after the German reunion, this historical fact let to an advancing awereness in Thuringia for having an own Oktoberfest at the tradition-rich green state! Especially the medieval-breathed city of Erfurt is predestinated to celebrate this important folk festival. According to the Munich pendant, the Oktoberfest in Thuringias capital kicked of in autumn, and this year from the 26.09. – 12.10. at the Cathedral Square. Shows and entertainment reached from nostalgia to modern rides, but also a large marquee provided variety and fun for the whole family. It all started officially – like the years before – with the Bock beer tapping by the mayor – and from this point, the celebration had its centre of attraction right there. Another real attraction was the world’s largest portable Ferris wheel „Bellevue“. The enclosed gondolas ride up to 56 meters in height. Further, a lot of spectacular carousel rides invited visitors – and among other things, for the first time a ghost train, where guests were shaked and tipped in their seats. Finally, a couple of hundreds of thousands visitors attended the Erfurter Oktoberfest. Statistics from the hotel and lodging sector confirmed also a significant increase in foreign visitors to this popular event – a good sign for even more attractions and rackets in 2009! Just two more weeks and the Thuringian barbecue season will be opened with a celebration at the Cathedral Square in Erfurt! The three „originals“ from the 1st German bratwurst museum, Propst Johann von Siebeleben, master`s butcher Huldreich Jacobi and journeyman Hans Wurst, are wearing their garp already – to ignite the bratwurst sausage fire at the museum in Holzhausen. A ceremony, which can not be taken seriously. But those guys always invent something new to promote Thuringias most delicious piece of culture. On Wed 26th, they did the same for the festival at the Erfurt Cathedral Square. Everything will revolve around the sausage for the third time in a row – „Rusting Culture 2008 – Thuringia is glowing“ on April 12th. Better said, around the „Thuringian sausage“ first mentioned in a Arnstädter abbey bill back in the year 1404 – and protected since December 2003 in Brussels. „In the past year, 33000 tons of those were produced!“, said Horst Schubert, managing director of the association „Thuringian / Eichsfelder sausage and meat“. The FCC can win games!